Your home is your largest investment. You worked hard to get your home and you want to keep it updated and everything in it running smoothly. While it is easy to take your home appliances for granted when they are working properly, once they break down, it is all you can think of. Your home heating and cooling system is no exception. There are many things we have to take care of on a weekly, monthly, and annual basis such as grocery shopping, running errands, going to the doctors and dentist, etc. But when it comes to having your heating system installed or repaired, it is a service that you don’t acquire often which can make it difficult in choosing the right HVAC company. Trying to decide on an HVAC company that is going to keep your home nice and toasty in the winter and cool in the summer, and (most importantly), keep your family safe, can be a confusing task. Even if you do not have your HVAC system attended to on a regular basis, there are still some steps you can take to ensure you choose a high quality, reputable company that will do a great job for a fair investment. The first step to take is to see if the HVAC company is present online. Do they have a website? Is it up-to-date? Does it provide you with the information you need? You will want to see what types of products and services they offer and if their offerings align with your home heating needs. You will want to take note if they are accredited with reputable organizations. See if they offer resources for financing, specials, rebates and scholarships. A great sign to look for is to see if they are active in the local community. Does the HVAC company offer free estimates? You will want to be sure you are able to afford the HVAC service you need. Having an estimate is important to determine what services are going to be provided and at what cost. Responsiveness is vital in the event of an emergency. You will want to take note if they offer emergency services, and if so, how responsive they are. You can call them, send them a message on their website or Facebook page to test responsiveness. Another great resource is to look for their reviews online. Do they have a lot of good reviews on sites such as Angie’s List, Yelp and Google? Do they have a good rating on the Better Business Bureau? Following these guidelines listed above will go a long way in help you to choose a reputable and dependable HVAC Service Company in your local area. 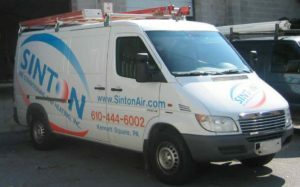 Call Sinton Air Conditioning and Heating Inc Today for Your FAST Heating Installations and Repairs! Serving local PA communities such as but not limited too; Avon Dale, Ardmore, Berwyn, Chadds Ford, Coatesville, Concord, Devon, Downingtown, Exton, Glen Mills, Kennett Square, King of Prussia, Malvern, Media, Newtown Square, Paoli, Thornton, Wayne, Aston, Westtown, East Fallowfield, Frazer, Glen Riddle, Haverford, Paoli, Parkesburg, Radnor, Swarthmore, Thorton, Villanova, Wayne, Westown, Chester Springs, Broomall, Glen Mills, Honey Brook, Phoenixville, Thorndale, Valley Forge, and Rosemont. West Chester, Wilmington Heater estimate heat pump furnace, and boiler estimates.